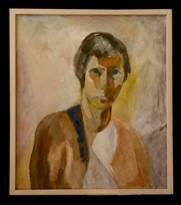 The painter Quita Brodhead’s (nee Marie W Berl) career stretched the entire length of the twentieth century. Born in 1901, to well-to-do parents who encouraged her interests, Brodhead’s financial independence allowed her to pursue a career in a field open to relatively few women. As an adult, she took the name Quita from a childhood nickname, Mariequita or “Little Marie”. Her travels in the 50s, always with paints and easel, included three years in France, and a year in Rome and in 1960-61, ten months in Tenerife in the Canary Islands, Spain. Brodhead’s paintings can be found in over twenty museums including: Philadelphia Museum, Philadelphia, Pa.; Pennsylvania Academy of Fine Arts, Philadelphia, Pa.; State Museum of Pennsylvania, Harrisburg, Pa.; Delaware Art Museum, Wilmington, De. ; New Jersey State Museum, Trenton, N.J.; Munson-Williams-Proctor Institute, Utica, N.Y.; Woodmere Art Museum, Philadelphia, Pa. and the Museo de Bellas Artes, Santa Cruz, Tenerife, Spain. Please contact Mr. Charles Brodhead at: charles.brodhead@verizon.net for any additional information. Thank you for visiting this site.